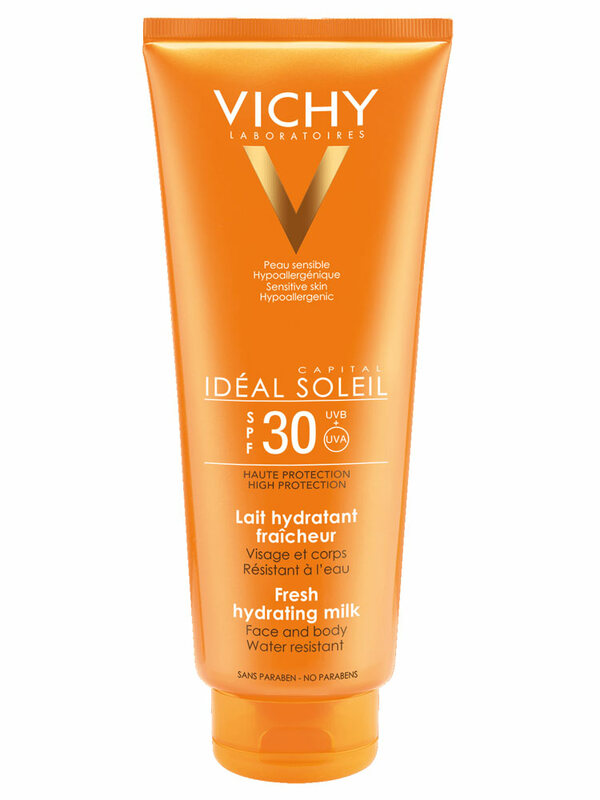 Vichy Capital Id�al Soleil Sun Milk SPF 30 offers deep cell protection to the skin against the sun. It is used on the face and body of adults and children, for all skin types including sensitive skin. Prevents photo-induced skin aging, pigment irregularities, pigment spots, wrinkles. Paraben free, hypoallergenic. Apply the product just before the exposure, renew generously and frequently especially after swimming, be wiped or perspired. Indication: Sun protection SPF30. Prevents the skin from skin damage related to UVA / UVB rays. Aqua, C-12-15 Alkyl Benzoate, Glycerin, Propylene Glycol, Isohexadecane, Titanium Dioxide, Butyl Methoxydibenzoymethane, Nylon-12, Octocrylene, Zea Mays Stays / Starch Corn, Alcohol Denat., Potassium Cetyl Phosphate, Synthetic Wax, Ethylhexyl Triazone, Acrylates / C10-30 Alkyl Acrylate Crosspolymer, Aluminum Hydroxide, Bis-Ethylhexyloxyphenol Methoxyphenyl Triazine, Caprylyl Glycol, Dimethicone, Disodium EDTA, Drometrizole Trisiloxane, Glyceryl Stearate, Palmitic Acid, PEG-100 Stereate, Phenoxyethanol, Silica, Stearic Acid, Tocopherol, Triethanolamine , Xanthan Gum, Perfume (Fragrance).